SHE looked up from a pair of shiny shoes twinkling under the moonlit sky to see the face of an unrelenting priest with his arms folded. A pair of friends had been caught red-handed chattering away in one on of the alcoves of Sts Peter and Paul Church, Bulimba, during the scheduled school mission days. One of the students was one of Australia’s most inspiring Aboriginal women and a long-time Bulimba girl, Aunty Joan Hendriks. “Well, I won’t tell you the end of the story but we certainly got pulled over the coals for it,” Aunty Joan said. The memory of a “naughty” schoolgirl skulking off from a Catholic school mission day returned to Aunty Joan when she sat in the church on its 100th birthday. For the centenary Mass, Aunty Joan was asked to give an Acknowledgement to Country which, to her, seemed an ironic request. “I have very vivid memories of the church, where the centenary was the other night, never dreaming that I would have been back here in this role when I was a student here. In a sense I didn’t have an authentic identity,” Aunty Joan said. Born in 1936, Joan was the eldest daughter of four children to an Aboriginal Ngugi mother and a Danish-American Irish father. She was born during the “tumultuous” Assimilation Policy era and, to make matters more difficult, her mother was not a Catholic so marriage in the Church was impossible. Aunty Joan had overall positive experiences at Bulimba’s two Catholic schools, Sts Peter and Paul Catholic School and Lourdes Hill College, but as a result of the law, Aunty Joan grew up disassociated from her Aboriginality. She recalled the disbelief of many past students at Sts Peter and Paul primary school and Lourdes Hill reunion gatherings, including the Bulimba parish centenary, when they realised her Aboriginality. “People in that group who are adults now, in conversations come up … they never realise that we were Aboriginal, but that was because we didn’t identify because that was not fashionable and that was the policy,” Aunty Joan said. It wasn’t easier with Joan’s initiation into the Catholic Church as her parents were not allowed to see her receive the sacraments. “While Dad couldn’t go to church, Dad was absolutely insistent after we got baptised that we go to church every Sunday and we did,” Aunty Joan said. She and her siblings would catch a ride with the neighbours, sometimes filling an entire car with seven children on the way to Mass. Aunty Joan only found out the identity of her godparents two years ago. She said she only learnt of her parents being social and community outcasts when she was married and in her mid-20s. “As a child I wasn’t aware of all these policies,” Aunty Joan said. Her awareness sparked a “resurrection” of her Aboriginal heritage and, for the past 30 years, she has been pioneering indigenous Australian issues including true reconciliation and justice for the traditional owners. 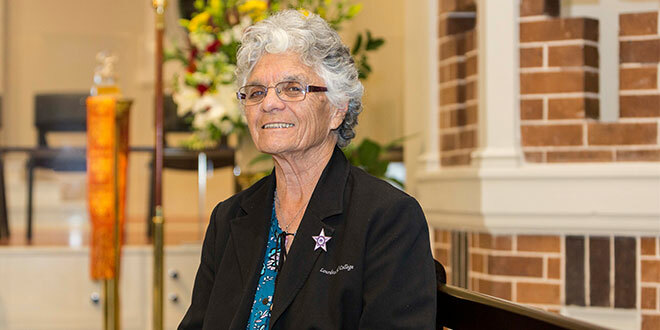 Today, Aunty Joan is the elder in residence at Lourdes Hill College, an associate of the Presentation Sisters of Australia, a chair on many committees serving young Aboriginal delinquents, and has a regular presence in many Catholic schools. Without a doubt, her favourites are Sts Peter and Paul and Lourdes Hill College. “It’s part of me,” Aunty Joan said.